Basic Juice - the wine blog for my generation: Now With No Oak! 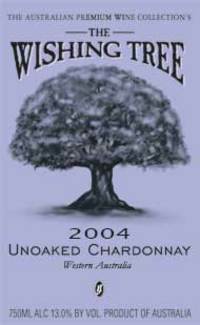 This is practically what the label of Wishing Tree Unoaked Chardonnay screams. It appears as if some of the Aussies (at least Western Aussies) are anticipating the swinging back of the XtraOaked-Chardonnay-pendulum. It will be interesting to see how many hop on the unoaked bandwagon (Brampton of South Africa did this a few years ago). In the meantime, enjoy Chardonnay's lighter side. Try it with grilled chicken breast, chicken-pesto pizza, or fish tacos. Actually there's a long tradition of making unoaked Chardonnay in Australia. Check out producers like Tyrells who have been doing it for about 40 years. Yup. But the more mass-marketed/$10-range stuff (Yellowtail, Bulletin Place, McPherson, etc.) that your average consumer purchases has mostly been heavily oaked. That was my point.